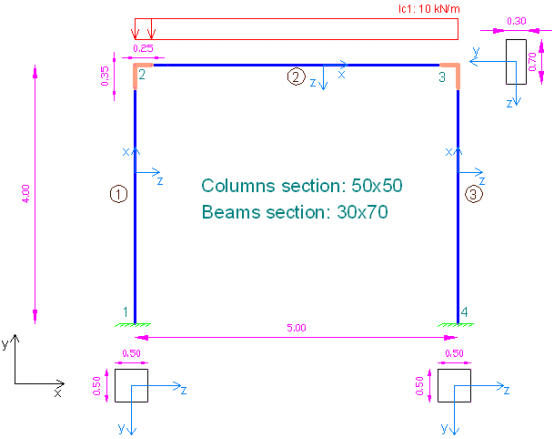 In this example, we will call the 3D Frame Library from a Visual Studio project and carry out a structural analysis on a simple frame. We will first provide the geometry, material properties and loads and afterwards call the corresponding routine in order to obtain the results. We will first create a new C# Windows Application project from Visual Studio and follow the following steps to carry out the structural analysis according the data provided. Please notice that we could use any other .NET compatible language and take the corresponding steps. The source code of all examples can be downloaded here. This example corresponds to the Example 6. 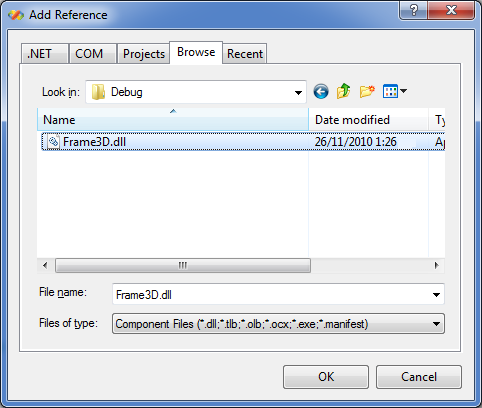 A reference to Frame 3D Library can easily be added by right clicking on the application project and selecting Add --> Reference.